I came across today's poetry book when I was visiting the library not long ago, and I fell in love with it. The art was the first thing that caught my eye. 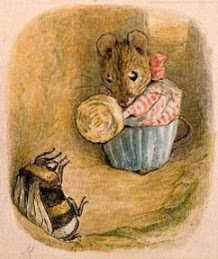 I am a huge fan of Barbara McClintock's work and always pick up a book when I see her gorgeous creations on the cover. Then I started to read the poetry and the preface to the book. Natalie Merchant put her heart and soul into this title, and let me tell you, it shows! After the release of her album, Natalie was contacted by Frances Foster, an editor at Farrar, Straus and Giroux, who wanted to take her songs and turn them into a picture book for children. Thus it was that Natalie’s songs, which are a celebration of the written word, were paired with Barbara McClintock’s lush, colorful, and wonderfully detailed artwork. and a “troublesome” doctor. All of these encounters could have ended very badly for Isabel, but thankfully the little girl was not the kind of child to worry or “scream or scurry.” In every instance, Isabel very firmly, yet calmly, dealt with the threat. This book is, without a doubt, a real treasure. It is a joy to read and a delight to look at, and would make a wonderful addition to a child’s library of ‘treasured books’.